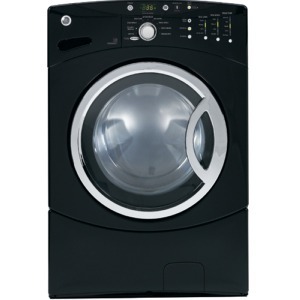 GE WCVH6800JBB Frontload Washer (Black) 4.0 Cu. Ft. The GE WCVH6800JBB 4.0 IEC Cu. Ft. King-size Capacity Front Load Washer has numerous options to meet the cleaning needs of almost any household. From the 4.0 cubic feet capacity to the easy to use settings, this washer has all the essential features needed. All the washer cycles you need to get your laundry thoroughly clean are available: 2nd Rinse, Active Wear, Drain and Spin, PreWash, Stain Wash, and Speed Wash.
All kinds of garments can be washed, thanks to the 26 selectable cycles. Hand wash, delicates, colors, whites, and easy care are just some of the cycles included. There's also a custom cycle feature that automatically saves the wash settings you use most often. Clothes get the right treatment depending on how heavily soiled they are. The following optional soil levels are available for further customization of each wash cycle: heavy, light, normal, and extra light. The machine's HydroMotion wash action improves cleaning performance while still being gentle on fabrics. Six wash/spin speed combinations give you enough options. Choose from five wash/rinse temperatures to get the right setting for your garments, including Sanitize to get rid of germs. The PerfectTemp Deluxe temperature regulator ensures that you get the correct temperature every time. The HydroHeater internal heater boosts wash temperatures to make it easier to remove stubborn stains. Get the best cycle time, thanks to the Adaptive Logic system. This keeps information from previous cycles, such as water pressure, so that the machine can automatically determine the most optimal cycle time for each load. Timed Flow-Thru dispensers for detergent, bleach, and fabric softener ensure that you'll always get the right washing aid added at the right time. A durable stainless steel wash basket has a capacity of 4.0 cubic feet- enough for an average sized load. The Quiet-By-Design package minimizes noise during operation. This machine is Energy Star-qualified, ensuring that it meets the government standards for energy efficiency. A sleek black finish and an ergonomic design give this washer a modern look. Easy to use rotary electronic controls are combined with LED indicators so that you always know what's happening with your laundry. These indicators include LED Cycle Countdown and LED Cycle Status lights. A see-thru glass door makes it easy to visualize your laundry during a cycle. The TrueGrip door handle makes it safe and easy to load and unload the washer. This washer cleans clothes efficiently and thoroughly. The numerous cycle options make this washer very versatile. The capacity is large enough for most average households. This washer uses very little water and is extremely energy-efficient. Some customers have observed that water pools in the dispenser drawer and door gasket, or leaks out the door altogether. Cycles are sometimes too long, or do not work correctly. Customers find the accompanying accessories, such as the stacking pedestal, overpriced. If the machine requires repairs or service, GE customer service is sometimes inefficient and difficult to deal with. Comments for GE WCVH6800JBB Frontload Washer (Black) 4.0 Cu. Ft. There is little good i can say about this model of washer.At the first few months it seems to be the perfect washer but within one year it will develope some serious problems like not draining properly,or locking the door even if the washer isn't washing anything,or flooding your entire room where you put it in and also makes the water smell really awful.safe to say dont buy this overpriced piece of crud.